HPLIP project provides printing support for over 2,080 HP printer and scanners. It is free, open-source software distributed under the MIT, BSD, and GPL licenses. 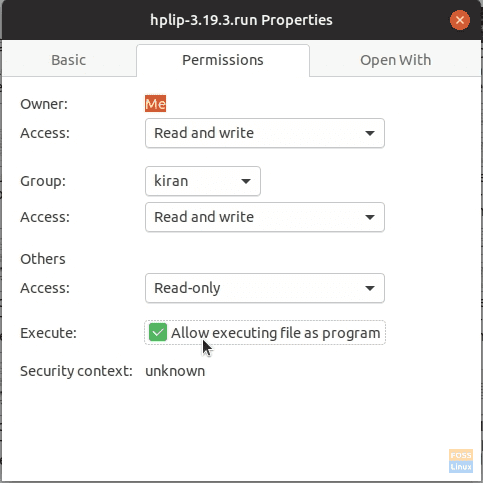 The HP Linux Imaging and Printing (HPLIP) software for HP printer and Linux – based scanners has been updated to version 3.19.3. For those new to HPLIP, HPLIP is an HP solution designed to print, scan and fax HP inkjet and laser-based printers on Linux. It includes Deskjet, Officejet, Photosmart, PSC (print, scan, copy), Business Inkjet, LaserJet, Edgeline MFP, and LaserJet MFP, and the HPLIP project provides printing support for over 2,080 printer models. HPLIP is free, open-source software distributed under the MIT, BSD, and GPL licenses. Note that the Multipick feature is not supported on HP Scanjet Pro 2000 S1HP Scanjet Pro 2500 f1. On LinuxMint 19.1, if the cups is not printing from the localhost:631, the workaround is to install the cups-filters. Launch the Terminal and enter the following commands to reinstall cups-filters. Download the .run file from the official website. Right-click on the downloaded file and select “Properties“. Make the program executable by checking the box “Allow executing the file as program”. 4. Assuming that the downloaded file is in the “Download” folder, enter the following commands to navigate into the downloads folder and execute the .run file. Make sure to replace the version number in the command below with that of the version you have downloaded. 5. Pay attention to the progress in the Terminal and enter ‘a’ to complete the installation.